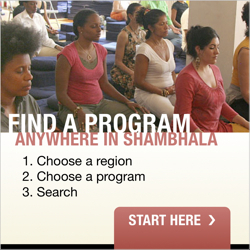 This calendar time has been rented by the Shambhala Centre to this group. Meditation is now offered every Saturday morning (with some well managed exceptions) in the upstairs shrine room from 9 – 11. It is an on-going class, comprised of a loose-knit group calling itself the Middle Way Sangha. Meditators of all levels of experience are welcome and likely to find it interesting. The sessions are led by Wayne Codling, who is a lineage holder in one of the major Zen groups in North America, the SÅtÅ Zen lineage of the San Francisco Zen Centre. The strong emphasis in this group is the meditation itself, not the religion of Zen Buddhism. The teacher and many of the on-going group are Buddhists but the group does not do much ceremony, little chanting and requires no affiliations at all. There is a lingering “stench of Zen” (old Zen phrase) but this group's purpose is the infiltration of meditation into the routines of everyday life. Each session begins with a talk about meditation, including basic instruction for any beginners. Following that there is a 30 minute seated meditation, followed by 20 minutes or so of walking meditation, usually outside. There is an opportunity to gather together very informally after these two periods of meditation to ask questions or offer thoughts. There are no fees or charges of any kind. A donation is requested: donations are anonymous and entirely voluntary.